This page attempts to enlist all the known Tombs in Petra. There are eight designs of tombs in Nabataean architecture. They are distinguished by the complexity of their carvings and whether they have columns, pediments or arches. The facade of al-Khazneh (the Treasury) at Petra the most iconic archaelogical site. 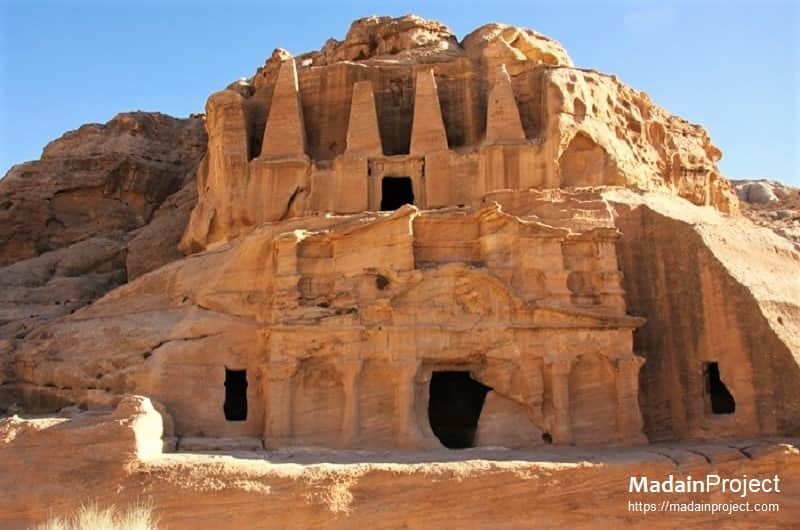 The structure is believed to have been the mausoleum of the Nabatean King Aretas IV in the 1st century CE. It became to be known as "Al-Khazneh", or The Treasury, in the early 19th century by the area's Bedouins as they had believed it contained treasures. The white shrine covering the supposed grave of Haroun As brother of Moses, on the peak of Jabl-i Haroun, Petra. A 14th-century Mamluk mosque stands here with its white dome visible from most areas in and around Petra. The facade of the so called Urn tomb, suggested to beling to the Nabataean King Malchus II who died in 70 CE. The vaults supporting the terrace as-sun (prison) – perhaps myth, or reflecting a later use. It is believed to be one of the Royal Tombs. The facade of the Palace Tomb, the lower part consists of 12 decorated columns and four gates. The second portal from the left is one of the most detriorated. The four portals lead in to four separate burial chambers, with three distinct stories in it's facade. It is believed to be one of the Royal Tombs. The al-Deir Monastery was built by the Nabataeans in the 1st century and measuring 50 metres (160 ft) wide by approximately 45 metres (148 ft) high, architecturally the Monastery is an example of the Nabatean Classical style. It is the second most visited building in Petra after al-Khazneh. The Deir's facade is comparable to the Khazneh; in each building, the upper story is designed as a broken pediment, interrupted by a tholos that is topped by a large urn. However, the plain (though impressive) facade of the Deir lacks the fine detailing that is found on the face of the Khazneh. The tomb of Sextius Florentinus is the only tomb in Petra with an identifiable occupant. A Latin inscription over the doorway indicates that the tomb belonged to Roman governor Sextius Florentinus, who oversaw the province of Arabia. 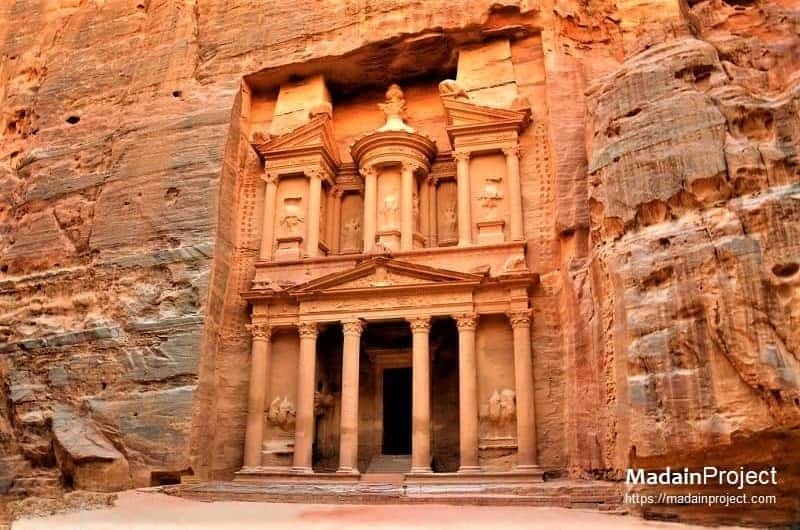 His dying wish was to be buried in Petra and his tomb was carved around 130 CE. Obelisk Tomb is located between the Petra Visitor Centre and the entrance to the Siq (south side of the path), there is a fine tomb with four pyramidal obelisks, built as funerary symbols by the Nabataeans in the 1st century BCE. The four obelisks, together with the eroded human figure in the centre, probably represent the five people buried in the tomb. Turkamaniya Tomb, large hall from which a narrow passageway leads to an equally large burial hall. The first hall was probably used as a dining room. This kind of arrangement can be seen in other tombs easily accessible to tourists, such as the Obelisk tomb, the Treasury, and the Urn Tomb. Street of Facades also known as the Outer Siq or Theater Necropolis is lined with tall, impressive tombs, with large facades or false faces on their fronts and leads down into the heart of the city proper. It is considered by some experts to be the oldest burial burial ground in Petra. Uneishu Tomb among the lesser tombs, the name comes from the inscription found nearby, presumably the surname of the family once buried inside. The tomb’s tall façade flanked by two columns with a double cornice is called a Hegr design. On the right is a much smaller version of the same architectural style. 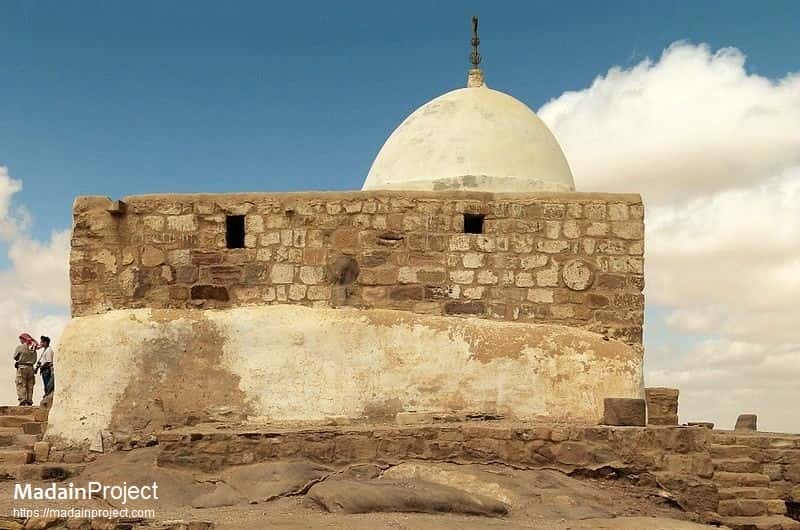 Historians believe the Uneishu Tomb was built for the “brother” or chief minister of Shaqilath II, a Nabataean queen. 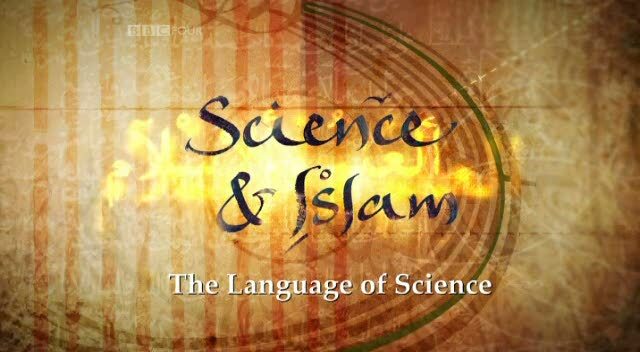 It was constructed around 76 CE. Unfinished Tomb, Petra (Wadi Musa). El-Habis area. Showing method of beginning from the top and working downward. El-Habis. Had it been finished it would have been the most elaborate and the largest tomb structure. The elegant façade of Renaissance Tomb with an intricately-made set of crowns and six Nabataean jars. crowned by a gable that has three funerary urns at the corners framed by Nabataean engaged pilasters. The interior has rock- carved loculi that were not used for burials; the tomb may be dated to 2nd century CE. In the area of al-Habis bedouins had taken over some of the tombs as residential structures. When Jordan authorities established the archaeological area of Petra they had to evict some Bedouins who living in these. According to Burckhardt no one lived in these on his travel to Jabl al-Haroun where he sacrificed a goat.